Boondi ladoo or mitai undo as in Konkani was in my cooking wish list since a long time. But wasn’t very confident to attempt. But today, after watching few videos from the you tube , I mustered some courage and started the process. I followed all the instructions like an obedient student given by Hethal and Anuja from Show me the curry.com and went on. I had seen many of my fb friends posting this ladoo in several food groups and used to admire them and bookmark their recipes too. 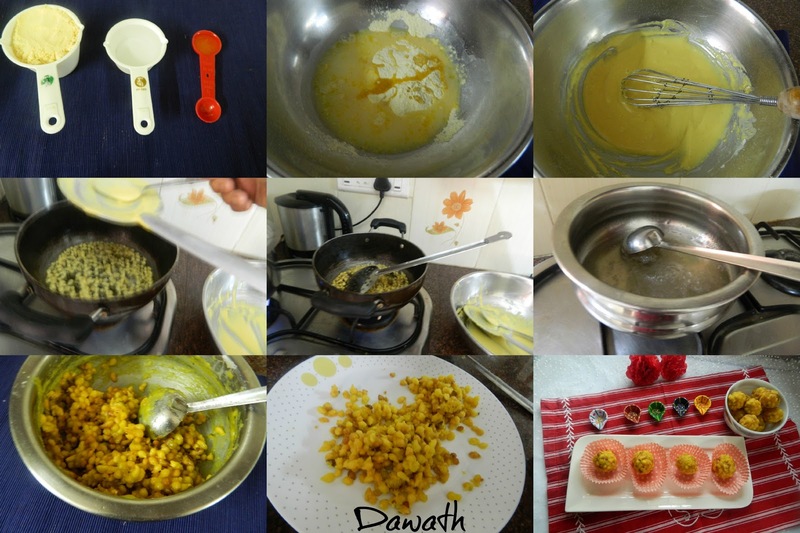 And finally, even I succeeded in the making of boondi ladoo . Happy Diwali friends! In a large mixing bowl,sieve besan, add ghee and water. Mix well until there are no lumps and keep aside. In a medium pan add sugar,saffron,3/4 cup water for sugar syrup. Mix well and cook on a medium flame for 9-10 minutes. Reduce the flame to simmer and continue cooking for 3-4 minutes. Sugar syrup should be of half thread consistency. Turn off the stove and add cardamom powder to the sugar syrup. Start heating oil for deep frying boondi’s. Once oil is hot,place a small amount of boondi batter onto a boondi maker or a perforated laddle(flat laddle with holes). Gently tap the sides or use a spoon to allow the batter droplets to fall into the oil. Using a circular motion with the spoon you can help the batter go through the holes. Fry boondi until golden,remove them from the oil allowing excess oil to drain off and place them directly into the sugar syrup. Using a different spoon ,mix the fried boondi into the sugar syrup,until they get coated. Wipe the bottom of the boondi maker clean each time before you continue frying the remaining boondi. Once all the boondi are fried and submerged into the sugar syrup,add powdered nuts and mix well. Allow the mixture to cool for few minutes. Dip hands in water,shape off excess and using a ¼ cup measure,take the mixture into your palms,shake off excess and press to form a round ball(ladoo). Continue to make remaining ladoos. Starting from from the first ladoo made gently press the ladoo a second time to make a tighter ball. Do this for all the ladoos. 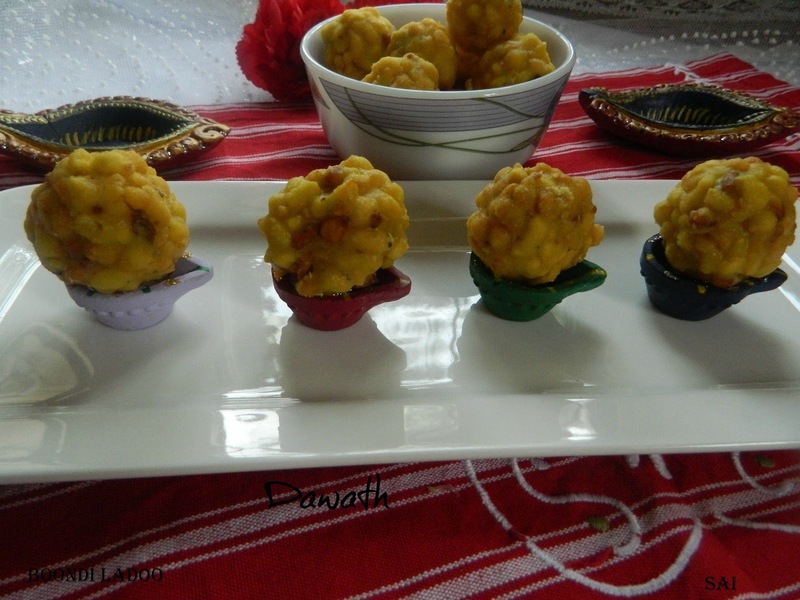 Allow the ladoos to cool completely and store it in a airtight container. 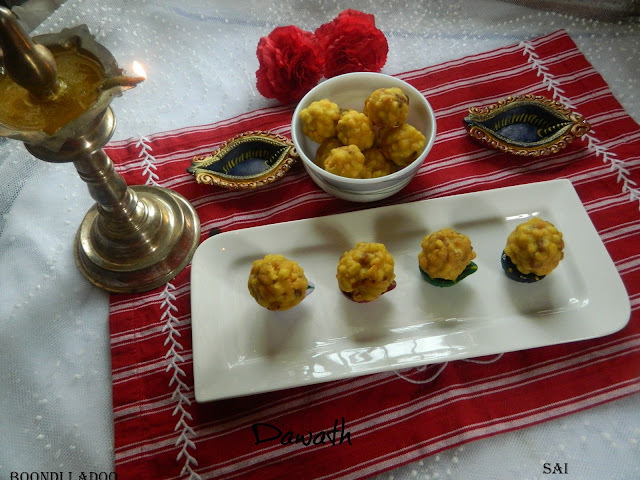 Ladoos can be kept in room temperature for 1-2 days and for longer period store them in the refrigerator. I would suggest use only 3/4 cup of sugar for the syrup, since my folks found the ladoo to be little too sweet. 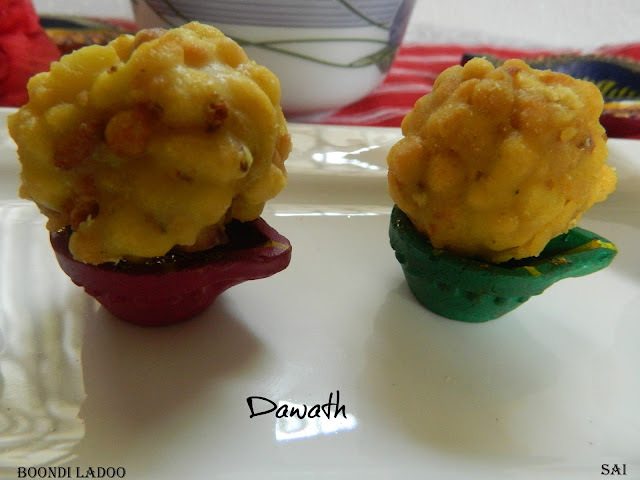 I did not use the cup to form the ladoos.